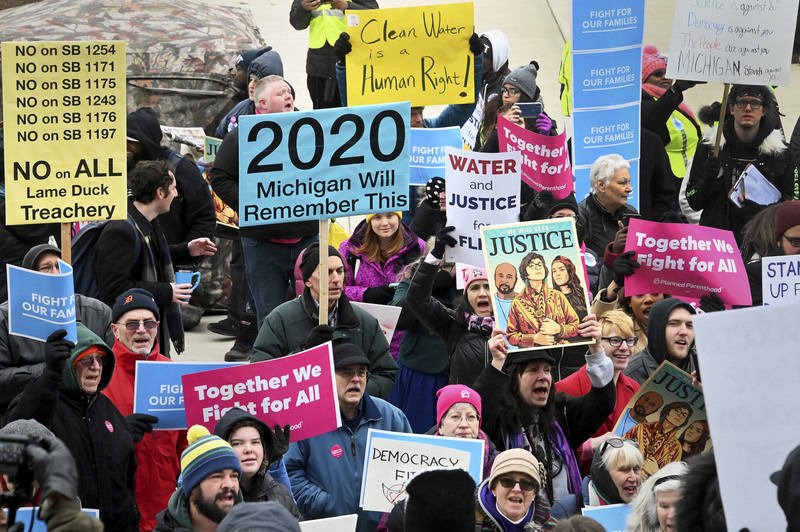 LANSING, Mich. — Michigan’s Republican-led Legislature raced Wednesday to pass bills in the final days of a contentious lame-duck session, as the fate of several key bills hung in the balance before newly elected Democrats take over top offices in January. The GOP will continue to control the House and Senate next term but will no longer have Republican Rick Snyder in the governor’s office, making this postelection period crucial to enacting legislation — some already signed by Snyder — that could face resistance from Democratic Gov.-elect Gretchen Whitmer. Lawmakers left the most controversial measures until today, the last scheduled day of a two-year session. Voting could extend into early Friday. Conservatives involved in successful abortion, tax and term limit initiatives in recent decades opposed the bill along with Democrats, liberal groups and volunteers for ballot drives. They said it is unconstitutional and an insult to voters. “What you’re doing in stamping out our voice,” said Daniel Smith of Portage, who volunteered for the initiative that put future rounds of redistricting in the hands of an independent commission rather than the Legislature. Many Republicans and the business community backed the legislation, saying ballot drives too often are controlled by out-of-state interests that use paid signature gatherers. “Voters from a wider variety of the state should get input on these proposals before they go on the ballot,” said the sponsor, Republican Rep. James Lower of Cedar Lake. He likened the proposed geographic limit to what is required of U.S. Senate and gubernatorial candidates. Snyder already has signed into law bills that significantly scale back minimum wage and paid sick leave laws that started as ballot initiatives and were preemptively adopted by GOP lawmakers so they could be more easily changed after the election. The unprecedented maneuver is bound to be challenged in court. Snyder also signed legislation to help implement his deal with Canadian energy transport giant Enbridge to eventually replace an oil pipeline in the Great Lakes. Whitmer has criticized the agreement. Snyder has not tipped his hand on whether he will sign other controversial bills, should they reach his desk. One finalized Wednesday would make it a crime for government agencies to require the disclosure of nonprofits’ donors, which some see as a pre-emptive strike against any attempts by Benson or Nessel to target the influence of “dark money” in elections. Republicans say the move would ensure First Amendment rights are protected.